Cranbrook archival documents indicate that, in September 1925, the Skinner Organ Company of Boston, Massachusetts was being considered as the builder for the church's pipe organ. By October of the same year, the stoplist for a three-manual and pedal organ had been drawn up. During this period, Ernest M Skinner had engaged the renowned British organ builder, Henry Willis, as consultant in an artistic alliance with his company in England. The original organ, therefore, reflected the influence of this great English organ builder. By December 1925, the stoplist had been agreed upon, and a contract was signed for a three-manual E M Skinner organ. In July 1927, a letter from the Skinner Organ Company responds to a desire from the church to enlarge the organ from a three-manual to a four-manual instrument, adding another department of stops. The addition and enlarged console were contracted for in November 1927. As the back portion of the overly large tower organ chamber had been walled in, another location for this additional new section had to be found. This new Solo section, located in a chamber on the north side of the choir above the working sacristy, "would certainly add tremendously to the effectiveness of the result" stated W E Zeuch, Skinner's second Vice President. The organ of 46 stops over four-manual departments and pedal was installed by the end of the year 1927. Between 1945 and 1955, various proposals from a number of builders in the US and Canada were developed to enlarge the Christ Church organ. Charles McManis, a small American builder, was chosen for the project. He came to the Christ Church organ in 1956 when the revival of the neo-classical style of organ-building was in its curious first phase. 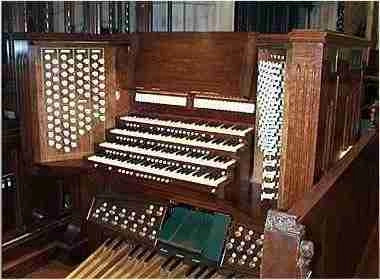 During this period, especially in the 1950s, new organs were built in what was thought to be "Baroque" style. All too often the neo-classical principles were half-understood. When an assortment of such pipework was sprinkled among very different tone-colors of an earlier generation in a rebuilt organ, the result usually was an unhappy combination. Accepting that there were shortcomings with the original Skinner installation - poor placement of the pipework and a deficit of clear, bright upperwork - the resulting McManis revision showed that he was following the trend of the day. In short, ranks of pipes were shuffled from one department to another with only slight improvement of placement, some bright "Baroque" high pitched stops were added, while some of the rich, full-bodied stops were thrown out completely. With an overall reduction in wind pressure, the result was a loss of character and majesty, even though the instrument was increased in size to 69 stops. By 1970, the original Skinner four-manual console, along with the additions and revisions required to incorporate the McManis rebuild, had deteriorated to the point where it was deemed essential to replace it. 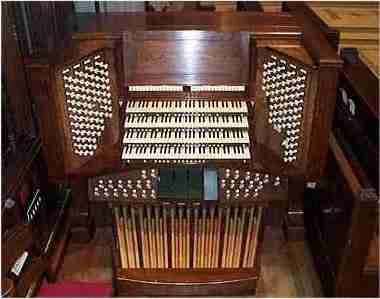 A new four-manual and pedal console by the Reuter Organ Company replaced the Skinner console. Near the end of the decade, the stop combination action in the console was beginning to fail, as were some of the delicate leather components in the pipe wind chests. Various mechanical and electrical malfunctions began to foretell the need for extensive and expensive repairs. In the early 1980s, a new solid state stop combination replaced the combination mechanism in the Reuter console. Following water damage to the tower organ, several of the Skinner wind chests were releathered. A new wind chest was required for the commanding Skinner Tuba Mirabilis, which had been repositioned horizontally from its original vertical placement. Remounting it vertically on its new chest solved most of its misbehaviour. The late 1980s and early 1990s were characterized by increasing evidence of mechanical deterioration, wind leaks, various troubles and unreliability due to the age of the instrument. Although the need for expensive renovation had been identified and financially planned for in two previous capital fund raising campaigns, it was not until the 1992 Capital Campaign that the present project was given the go-ahead. Preliminary planning in order to determine a project cost had begun in 1991 for either a complete rebuilding of the instrument or its replacement. Early in 1992, the Organ and Carillon Renovation Committee was formed to plan for and oversee the two projects. During the summer of 1993, a subcommittee of three committee members, the organ consultant and the two staff musicians, travelled to the east and west coasts to audition representative instruments by the two leading prospective organ builders for the Christ Church organ project. Impressed by two superb organs and vast experience restoring, rebuilding, and reconstructing existing and historic instruments, the committee selected British organ builder, N P Mander Limited for the Christ Church organ project. From the outset, the Mander organ builders proposed the preservation and re-instatement of the 1920s pipework as a basic and important element in reconstruction. They adopted as the general principle for the project a recapturing of the style of the Skinner organ with any additions or alterations being compatible with that style. The resulting instrument includes more of the original Skinner pipework than the McManis revision of 1955/1956. The 1997 E M Skinner/N P Mander organ contains 96 stops over six manual divisions and two pedal sections. All mechanical and electrical components are new: soundboards, actions, winding and layout. The new four-manual Mander console is constructed in a traditional English style and blends harmoniously with the woodwork and decorative carving of the church. Behind the decorated organ case, the tower organ, containing 74 stops, will accompany the full congregation in its music for worship and will play the full range of organ repertoire with uncompromised majesty and subtlety. The 22 stop Chancel organ with two manual divisions and pedal was designed with the accompaniment of choirs and small ensembles of singers and instrumentalists in mind. The entire instrument is playable from the handsome, new four-manual console that incorporates a solid-state combination system with 64 levels of memory. As with our project for the Princeton University Chapel, the successful restoration of the surviving Skinner pipework at Cranbrook, and the incorporation of new stops in a compatible style, have resulted in a thrilling and versatile instrument. It has proven to be a great companion to the church's extensive music programme, under the direction of Charles Raines, Music Director at Christ Church since 1980.